Wearable tech has seemed on a fairly straightforward path throughout the course of its initial development – from the step counter, to the fitness band, to the smartwatch. But the wrist has long been a home for a more refined and storied piece of tech: The wristwatch. And while smartwatches attempt to reimagine that gadget for a modern age, only the new Withings Activité tracker nails the execution in a way that will actually appeal to watch lovers, and to everyday people who still think even the best looking Android Wear gadget is a fugly mess. The Withings Activité is possibly the perfect activity tracking wristband. That’s mostly because it barely even is one, preferring instead to masquerade as a finely crafted Swiss watch, with a minimalist face, clean lines and subtle detailing that will appeal to connoisseur while also keeping those with more broad tastes satisfied. It also serves just as well as any other activity tracker on the market, but it doesn’t make a big deal about it, which is exactly what most consumers are looking for. I mostly say the Activité is perfect because it’s managed to attract more compliments than any other activity tracker I’ve ever worn or tested. It’s the first one that anyone with any serious sense of style (and I say that knowing I have none) has expressed interest in owning, and it’s the only one watch-type device that has appealed to those I know with smaller wrists. Building a wearable smart device that anyone besides early adopters and the tech curious actually want to own is no small feat. The calfskin band that comes in the box is comfortable, if a little narrow for larger wrists, and the silicone band that also comes with the watch is great for all-day (or all-night, for sleep tracking) comfort, and since it doesn’t taper, it makes the Activité itself look better on larger wrists. The silicone strap is also great for running, which the Withings can handle well even though it doesn’t have the outward appearance of a sport watch. Withings has put the activity tracker display on the Activité in a sub-dial on the watch face, and this has very fine internal circular texture detailing that’s great when you go in for a very close look. 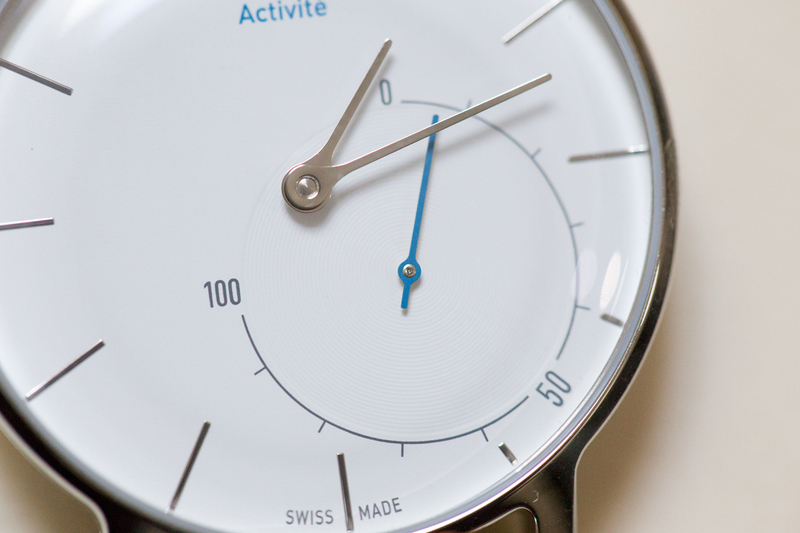 The blued hand on the activity meter is another nice touch, and a nod to the craft of watchmaking. The silver time indicator hands are easy to read and thin for more accurate time keeping. Speaking of accurate time-keeping, the Activité actually uses your iPhone’s time to set, which is why there’s no crown on the wearable at all. Watching the Activité set itself after you’ve paired the device with the Withings Health Mate app is almost magical, and a side-benefit is that when you travel, you can simply open the app to initiate a sync and your watch will automatically update to the time of your iPhone, which itself automatically changes once you connect to new networks in new time zones. It’s a small thing, but a very cool one, too, that turns the Activité into a great travel watch in its own right, leaving aside the smart fitness features it offers. Other watches with single-button time zone adjust features can cost just as much, even with a quartz movement, so it’s something to keep in mind when weighing the value of the Acitvité vs. the price. The Activité doesn’t include a heart rate monitor, but it does automatically switch to tracking running when you begin that activity, and it also will auto track swimming with a future update. Withings isn’t clear when exactly this will arrive yet, but it’s a value-add feature, and the Activité is plenty impressive enough even without it. The group of users who need what it offers, and swim activity tracking is also likely small. While the watch doesn’t do much besides track your steps and tell the time, that’s all it really needs to do, and it does work as a sleep tracker if you’re willing to wear it on your wrist all night and set it to monitor your Z’s in the companion app. The Withings offers solid activity tracking, in line with the kind of data provided by the Withings Pulse, which is to say that while it isn’t accurate in the way that might be required for Olympic training, it’s fine for the needs of any average user. The device is clearly marketed at casual fitness fans anyway, those who are looking for a general indicator of their fitness level, in a device they’d likely wear even if it didn’t offer that benefit. The meter design of the Activité’s activity indicator is a good way to convey that kind of information, and it provides a rough percentage-style look at progress towards your goal, which again is better for this specific type of activity tracking than a precise count (especially given that this category of fitness device makes no solid claims on precision accuracy). It’s plenty enough to motivate you to fill up that meter, but Withings has locked in the goal so that it’s 10,000 steps, regardless of what a user would like to shoot for. It’d be nice to have more options, but again a 10K goal should be enough to encourage healthier lifestyles for most. The Activité’s most impressive performance features centre around the automatic time zone updates, and the fact that the battery will last for eight months or more. The company provides a second battery, two, so you’ll be well into a year before you need to even think about tracking down batteries of your own. That’s a huge advantage when it comes to the general wearable market, and combined with the design, makes this easily the activity tracker best-suited for general consumer interest. That said, the Activité isn’t priced for the mass market: At $450, it’s comparable to very nice quartz wristwatches, rather than other fitness bands on the market. Most people won’t spend that much on a watch, however, and I expect they won’t be convinced to essentially quadruple the price of a Jawbone UP just to get a nice timepiece in the mix, either. Ultimately, though, the Withings Activité is the only fitness tracker out there likely to grace the majority of owner wrists for more than a couple months at max. It’s the first wearable device that will actually appeal to watch fans, regardless of any previous claims to that effect, and that will help it find a niche audience willing to spend the price Withings is asking. Another way to think about is to consider that most wearables fans would probably accrue four or five different fitness devices in the next year anyway: The Activité is a single, but smarter buy for tech that’s genuinely useful, and yet genuinely fashionable at the same time.